Since medieval times spices have been a vital part of food preparation. The unique location of Istanbul made it an important center for the spice trade. The city is located on the trade routes between East (where most spices are grown) and Europe. 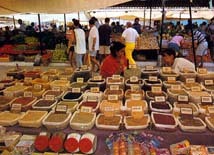 Today you can find a wide range of dried herbs and exotic spices on sale in markets and stores throughout Turkey.